Men, it’s time you’ve learned a little about Edwin Jagger Safety Razors. Much like the mythical straight razor, shaving with a Safety Razor has seen a resurgence in popularity. There are plenty of reasons for this, from the mounting cost of a half-way-decent disposable shaver to the desire for a close shave that looks great long into the evening. And when it comes to safety razors, it’s tough to beat the quality and established reputation built by a company such as Edwin Jagger. Established in 1988 in Sheffield, England, Edwin Jagger is a family-run business. They sought to set a benchmark the male grooming standards and quickly became one of the world leaders in the wet shaving industry. Companies, such as Gillette, soon began to commission them to design quality and luxury shaving items. To this day, each piece is personally designed by Neil Jagger, the owner, and founder, and you can find his work available in markets all over the world. There are plenty of men that swear by his work, too. They won’t allow just any old razor touch their face. For many who haven’t used one before, a safety razor may seem quite complicated. In reality, there are only three components to an Edwin Jagger safety razor: the blade, the handle, and the head. While there are many fine options available for a double-edge blade by makers all around the world, the people at Edwin Jagger pride themselves on producing well-balanced and elegant handles designed for the ultimate shave. One of the most common things men look for in wet shaving tools is how easy it is to hold on to. Edwin Jagger makes its handles of brass. The brass is lightweight, well-balanced, and plated in chrome, so not only do you get a great, even shave, the handle remains comfortable, and it looks great in your grip. They also offer faux ivory and a faux ebony handle for men who want a different look, or even a different feel. The cutting heads of the Edwin Jagger De8 series (their current line) are the same for every model. The head is made of two parts that screw into the handle. The head is a closed comb (solid) style, which means that there are no comb teeth to straighten and guide hair to the blade. Men have their preferences when it comes to combing types, but you really don’t need comb teeth unless you are shaving more than a quarter inch of growth. And if that is the case, you’re better off removing that growth with beard trimmers first. The beauty of Edwin Jagger safety razors is that any standard double-edge (DE) blade will fit into the head. This allows you to use your favorite blades while keeping down expenses. A hundred quality blades, such as Derby Extra Double Edge, will cost you much less than a pack of disposables you’d find at the supermarket. And you’ll get a much closer shave, too. Aggressiveness is a big thing to consider when selecting any razor. With medium aggressiveness, Edwin Jagger has hit the sweet spot. With every one of their offerings, you’ll get a close shave while at the same time reducing the risk of cuts and irritation. A safety razor with a medium aggressiveness is a good bet for beginners and experienced shavers. Weight usually comes down to personal preference. Some men find a heavy razor difficult to control while others feel the same about light ones. Since all of the De8 series have the same head, weight differences are found in the handle itself. Handles made with resin, such as the De86bl and De87bl, weigh slightly less than the all-chrome models. 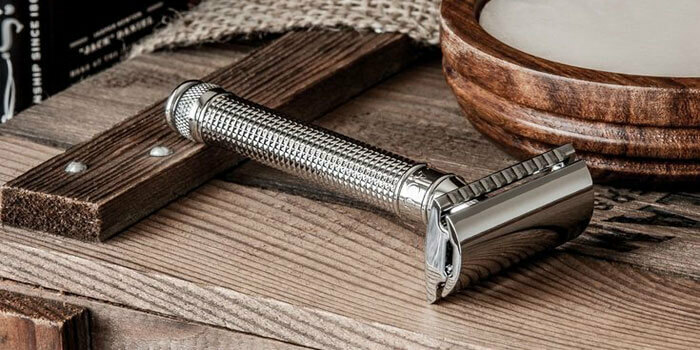 With a chrome finish, this is the sort of safety razor that’s all about style. The last “l” in the product number stands for “lined” and it just might be the one you are looking for if, like a lot of men, have a little trouble holding the handle when the fingers get wet. Lightweight and expertly balanced, this great looking grooming tool is perfect for beginners. Measuring 3.8 inches long and weighing in at 2.2 ounces, the De89lbl is the whole package, at an affordable price. This slick looking offering from Edwin Jagger has a mirror-bright chrome finish and is equipped with a glossy black faux ebony handle. Truly a classic to behold, the De86bl continues the tradition of the style and luxury of the safety razor, with a modern twist. It weighs 2.1 ounces, measures 3.8 inches long, and fits the average hand like a glove. The ivory handle of this particular offering from Edwin Jagger has that old-time appeal many men are looking for these days. The De87bl comes with the same high-quality closed comb head that you get with any model within the series. The De87bl is 3.8 inches from head to handle. And, weighing 2.1 ounces, it the sort of safety razor for those that shave with a light touch. There is any number of reasons why men prefer a particular type or style of razor. Men that choose safety razors have an equal number of reasons, but there is a common thread among the most popular: a close, comfortable shave at an affordable price. That is what you get with an Edwin Jagger safety razor. And that’s not even mentioning the company’s high-quality standards. Choose a style and slip in your own blades, and soon you will turn your daily shaving routine into a beloved ritual. Also, consider reading about another top safety razor brands like Merkur and Parker. Hello,I read your blog named “Edwin Jagger Safety Razors: The Definitive Guide 3 Reviews” like every week.Your humoristic style is awesome, keep doing what you’re doing! And you can look our website about proxy server list. Did you receive my razor and brush back?